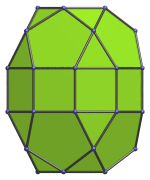 The elongated pentagonal orthobirotunda is the 42nd Johnson solid (J42). 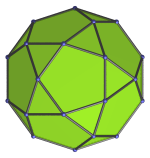 It has 40 vertices, 80 edges, and 42 faces (20 equilateral triangles, 10 squares, 12 pentagons). 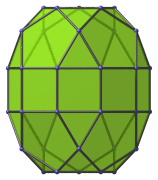 The elongated pentagonal orthobirotunda can be constructed by attaching two pentagonal rotundae to a decagonal prism, or equivalently, inserting a decagonal prism between the two halves of a pentagonal orthobirotunda (J34). The ortho- in the name refers to how the top and bottom pentagons are aligned with each other. 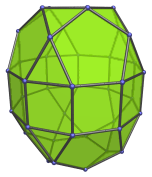 If they are rotated with respect to each other instead, the elongated pentagonal gyrobirotunda (J43) is produced instead. Last updated 17 May 2018.